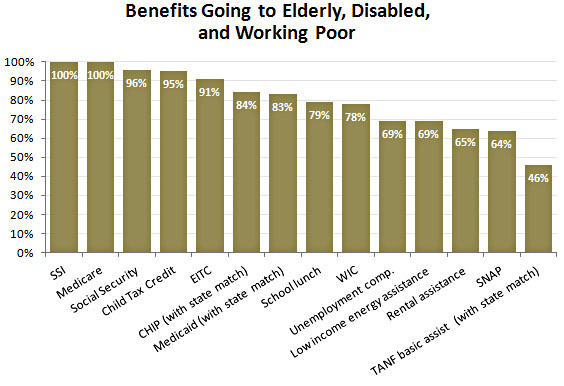 Who Actually Benefits From Federal Benefits? Republican candidates have lately been parroting Charles Murray’s argument that our “entitlement society” has created a nation of deadbeats who would rather live off government benefits than find a job. In response, the Center on Budget and Policy Priorities (CBPP) released a study earlier this week showing the fraction of government benefits that go to able-bodied workers. Their estimate is about 9 percent. I linked to the CBPP study on Monday, and since their methodology was fairly complex, I added a back-of-the-envelope version that simply added up the benefits of programs that don’t serve the elderly, disabled, or working poor. I figured that would make the source of CBPP’s number a little more understandable. The next day I got an email from Arloc Sherman, one of the authors of the study. You can’t just add up these programs, he told me, because even a lot of programs that people think of as “welfare” actually serve the elderly, disabled, and working poor too. Medicaid is the biggest example: Most of us think of Medicaid as a program for the poor, but more than half of all Medicaid spending actually goes to the elderly and the disabled. Eighty-three percent of Medicaid goes to the elderly, disabled, or working poor. Seventy-nine percent of school lunches. Sixty-nine percent of unemployment compensation. Sixty-four percent of SNAP (food stamps). Even TANF, the classic “welfare” program, clocks in at 46 percent—and it’s a very small program. The other 54 percent only amounts to about $6 billion, a minuscule fraction of federal benefits, and ever since the 1996 welfare reform bill those benefits have been temporary anyway. It’s not really possible to become dependent on TANF any longer. Another point: Many of those who decry the growth of entitlement spending seem to forget the most basic of all facts about it: it continues to be driven overwhelmingly by the twin engines of an aging population and the rising cost of medical care. Neither of which has much to do with dependency among the working-age population. This is especially true for medical care, I think. We spend a fair amount of money on health care services for the poor, but even theoretically that does nothing to make them less likely to work. They still need money for everything else, after all. All it does is provide them with a bare minimum of decent health care. We can afford that, can’t we? UPDATE: I mistakenly said that all of Medicare and nearly all of Social Security goes to the elderly. In fact, about 81% of Medicare and 77% of Social Security goes to people over the age of 65. However, the chart is correct: 100% of Medicare and 96% of Social Security goes to the elderly, disabled, and working poor. I’ve corrected the text.